In the past several years, virtual reality (VR) technology has finally begun to fulfill what had long been promised. Traditional VR, which creates environments that allow people to be “present” in an alternative environment, has been advanced by offerings from Oculus, Sony, Google, and Samsung. At the same time, products like Google’s Cardboard have led the growth of 360-degree video that captures an entire scene in which the viewer can look up, down, and around. Instead of just games and entertainment, VR content is exploding with news, information, and educational content. 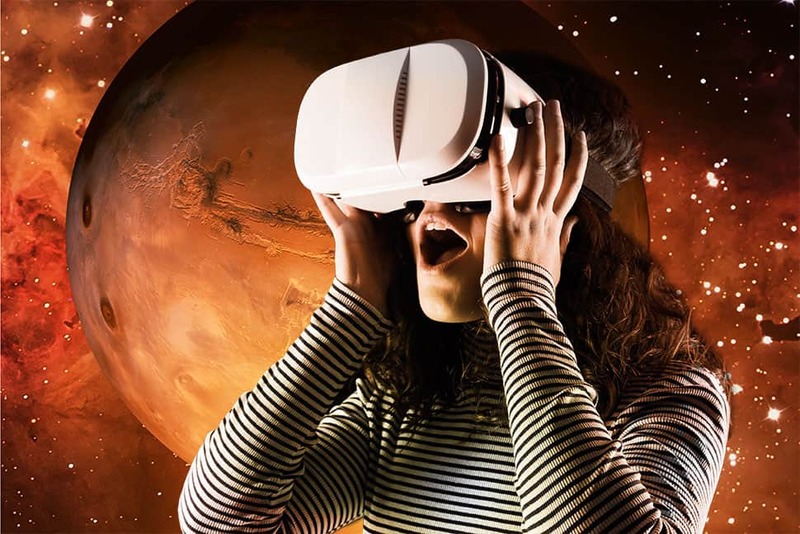 Throughout this period of growth and expansion, libraries and librarians have once again demonstrated their adaptability to new information formats and user needs with moves that reflect the various directions VR has moved. Whether it is classroom use of Google Expeditions, new educational spaces and lending programs on academic campuses, or a demonstrated commitment to equitable access to this new technology in public libraries, librarians have taken on VR as a new way to engage their users. 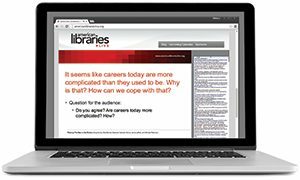 In the months and years ahead, library professionals will likely need to consider how VR and 360-degree video fit into their commitments to acquire and organize information, make the informational content of this technology available for reference and citation, and empower users to be both media consumers and creators. 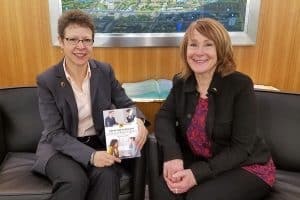 For now, through the examples shared by the participants in this interview and examples from across the profession, libraries and librarians are showing how they can innovate with this latest trend in media and information. American Libraries talked with six librarians and the director of a VR business to hear about their experiences. What was the tipping point for getting your library involved with virtual reality? Did you see signs on your campus or in your community that helped you think more intentionally about bringing VR into the library? Holzweiss: When I first saw Google Cardboard, I was intrigued by the simple yet powerful technology. When I experienced Google Expeditions at an International Society for Technology in Education Conference and Expo, I knew that this opportunity could transform education. As a connected educator interested in technology, STEM, and the maker movement, I thought that Google Expeditions would be a wonderful complement to further develop student critical thinking, problem solving, and leadership skills. It could also enhance Skype sessions and Flipgrid videos. Bardyn: In spring 2017, a research scientist booked the Translational Research and Information Lab—located in the University of Washington (UW) Health Sciences Library—to use the data wall in conjunction with Pear Medical software. He used VR to demonstrate to a medical team how to perform upcoming heart surgery. Our growth rate has been rapid, given that at least 32 researchers have been introduced to VR in roughly six months and we’ve begun a VR user group on campus. 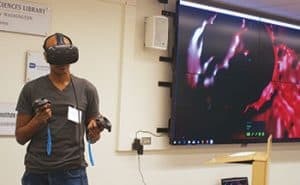 Via the user group, the library hosts quarterly meetings to demo VR technology from local upstarts and PhD candidates and faculty involved in VR research and development. Sanchez: The biggest indication that the library could embark on providing VR services and equipment came from the work that Bryan Carter in our University of Arizona Africana Studies department was doing with “The Virtual Harlem Project.” The project (which has gone through several iterations with Second Life and CAVE game structures) studies the Harlem Renaissance period through digital representations of Harlem, New York, in the 1920–1930s. The latest version, which uses the Unity game development platform, allowed the library to demonstrate his project using Oculus Developer Kit 2 headsets and get people excited about the possibilities of VR. Jones: We first became interested in VR in 2016. 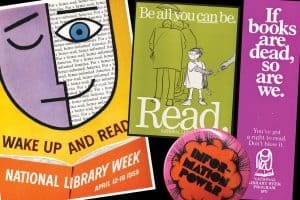 The technology was new, but we could see how it could expand our reach in a variety of ways, such as changing the perception of public libraries as staid book warehouses. We have great income and educational disparity in our county. Our goal was to offer VR to our underserved communities, where digital devices are not common and opportunities to use a new technology like VR would simply not be possible. Coles: We got involved in virtual reality because California State Librarian Greg Lucas visited the Marin County (Calif.) Free Library and heard about its plans for a VR project targeting underserved communities. He offered funding, which the library used to pilot the statewide project that we have now. VR equipment varies by cost and manufacturer. What was your approach to investing in specific equipment? What factored most significantly in your decision, and did you or your users test various systems before settling on a particular one? Holzweiss: “Bring your own device” is often a cost-effective alternative to schools purchasing hardware, but some students don’t own smartphones. Since our library was able to acquire a number of iPad Minis through DonorsChoose, I explored ways of using them for VR. Google Expeditions works very well on iPads, but Google Cardboard and other viewers offer a more immersive virtual experience that I wanted for my students. I could not see purchasing or fundraising for iPods to use with the viewers because the cost was comparable to the iPad Minis that we already had. But recently we have been able to acquire a number of iPod Touches. After researching I ultimately found a company that 3D prints VR viewers for iPad Minis. I was able to fund these viewers, as well as a Ricoh Theta 360-degree camera, through DonorsChoose. These viewers have worked very nicely but they are large. Bardyn: We wanted to provide VR equipment equal to or better than what our users would likely procure independently or already have, which really narrowed down the selection to the best in class or near to it. Since the best in performance comes at an exponential increase in price, our IT experts chose the next-to-the-top-level products. Two manufacturers of high-end headsets currently exist—Oculus Rift and HTC Vive—and the software ecosystems are not wholly cross-compatible, so for the sake of flexibility we purchased one of each. A dedicated laptop is the brains behind the VR headset with a high-end video card. The faster the video card is, the more complicated the models it can display fast enough to work convincingly in VR, and the models derived from medical imaging are pretty complex. Sanchez: Students working on VR projects in the library had been using the Oculus developer kits for a few years by 2016. Those particular headsets were purchased through shared funding with outside departments and housed in the library makerspace. My library colleague Jennifer Nichols and I built on that funding model by continuously getting small institutional grants to buy a couple headsets and computers. We definitely knew we had to start off small, not knowing the exact demand from the students and faculty, so we could easily track usage and potential for further investment. Another key feature of seeking out local grant funding was that we were able to secure buy-in from other campus entities, such as our university IT services and student engagement offices, and not have the perception of a boondoggle. Unfortunately we didn’t know anyone who could lend us a headset, and we didn’t have the ability to travel to demonstration stations, so we were unable to test equipment before we purchased it. After a few months of offering the HTC Vive in our makerspace, we decided to dedicate a small room to VR activities and dubbed it our VR Studio. This provided a secure place for the equipment, where people could safely use it without bumping into furniture or other people. We also purchased an Oculus Rift and set up another VR station in the room so that users could compare the different headsets. Coles: Through the efforts of the state librarian and also John MacLeod at VARLibraries, we were able to obtain donations of computers and Oculus headgear from Facebook 360 and Vive headgear from HTC. Both systems are used at Marin County. Each has its advantages, but both offer a robust virtual reality experience, and more educational VR “experiences” have been developed using one or the other of these systems. Did you and your team set up any specific or assumed goals for introducing VR into your library? How you are evaluating the benefits of having this technology among the library’s offerings? Holzweiss: We are still very much in the exploration stage in our library using VR. 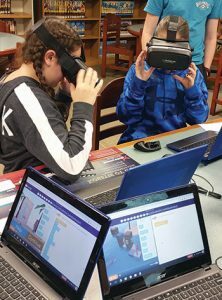 Social studies classes have visited ancient historical landmarks, and students have coded virtual worlds through CoSpaces. As teachers learn more about how to integrate VR into their activities, I anticipate more formulated goals and assessments. Bardyn: An important component of health sciences work is to connect the information and technology needs of National Institutes of Health–funded researchers, but the only way to accomplish this big-picture goal is to focus on smaller areas of innovation that need growth support. Our goal in the health sciences library is to adopt a growth mindset, testing and adopting tools and technologies based on what researchers are bringing into the library to use in our Translational Research and Information Lab. Although we make some equipment available—like a data wall, Amazon Echo, 360-degree camera—we also encourage users to bring in their own technology and devices. This 800-square-foot room acts like a collaboration and innovation lab that helps researchers—who work with other professionals—solve problems by using technology and expertise to improve health care. In the UW Health Sciences Library we are working closely with campus partners to design, build, and evaluate spaces and services that accelerate health care. These new spaces are frequently needed for access to technology and other expertise, not to mention learning about local startups and how to obtain funding dollars. We’ve never been afraid to sit at the table with those who are different from us, even when commonality seems elusive. Sanchez: One of our early partners in exploring VR was Matt Cook, head of emerging technologies at the University of Oklahoma Libraries. His team of student developers and staff had created a platform called the Oklahoma Virtual Academic Laboratory (OVAL), which allowed networked users to view and annotate 3D assets. This was really exciting because our library could market this as a teaching and collaboration tool to students and faculty, which is how we framed it when we went for local grants. Early on, our primary goal was to have some kind of impact on course curriculum and teaching through VR offerings, and OVAL was an early demonstrator of that. Another goal was to stress the utility of VR as a creativity tool for things like painting, drawing, animation, or games, but not the end-all, be-all of technology. Our ability to provide curricular outreach grew along with exposure: through tying assignments to VR software, supporting class projects, and teaching various VR development skills through workshops. Assessment has been tricky so far, particularly since we’ve been so focused on getting the word out and developing our own skill sets. I’ve been working with another librarian colleague of mine, Niamh Wallace, on getting qualitative feedback from students and faculty on their experiences with using VR in the classroom. Jones: A specific goal was for our community to get experiences it would not get on its own. The equipment and content is expensive and is mainly purchased by tech-savvy consumers. Our project made it accessible to multiple ages and in multiple venues. We have done it in libraries; in outreach at schools, fairs, and with our bookmobile; and even in a fire evacuation center this fall. We need to look at formal evaluations, but it absolutely cannot be discounted that VR users are amazed, delighted, and awed with the technology, so that in itself is a better outcome than many services we put significantly more effort and funding into providing. Coles: The goal for the statewide project was to offer public libraries representing a range of types and geographies a chance to test this relatively new technology with their patrons. We are issuing another grant to fund continuance of this project and will require participating libraries to collect and submit statistics, which we will use to evaluate demand for these technologies and how they are being used. 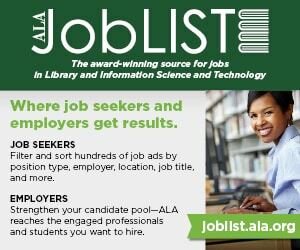 This data will help determine possible future directions and support for VR projects and programs in public libraries. How did you test or introduce VR to your users? Was a specific group the test group? Was any special outreach extended to community members? Holzweiss: I began testing with the 6th-grade teachers since I have a good collaborative relationship with them. They have an extra class period during the day where they can explore enrichment activities with their students. I also tested with our students during the Hour of Code event, as well as my student Techsperts and other students who visit the library during their free periods. Patridge: The test groups brought in their equipment and gave us feedback on the space they were using. Once we had an established group using the library space, we then added VR as an interest on our online reservation form. VR is our second-most-requested reason for using the space, so our test group is spreading the news by word of mouth. Here at UW, word of mouth and bulletin boards are the most effective ways of advertising. Sanchez: The library hosted a VR symposium in 2017, bringing together faculty, students, and local industry people to demonstrate their VR projects and participate in discussion forums for two days. There wasn’t a particular test group we were targeting, but our goal was to establish a learning community of enthusiasts, artists, developers, or anyone curious to learn about VR. MacLeod: First up to test in most libraries were the youth, while adults and seniors sat on the sidelines. As their curiosity grew, adults edged out the youth. Youth favored more interactive content, and adults steered toward experiences of being underwater with whales, soaring through space, or visiting Venice. Special screening sessions for adults in the morning, visits to retirement homes, or sessions with special-needs students saw dramatic increases in focus and retention. It’s easy to think about VR as just a technology, but what about space considerations (room to set up the equipment, space for users to move around and react to the technology)? How did you and your colleagues think about creating a VR space in your library? Holzweiss: Over the summer, bookcases and furniture were removed from our library to install new carpeting. It was a large undertaking to pack up, label, and organize the books as well as reshelve them. I learned, however, that sometimes “breaking down” offers us an opportunity to build up even better. Our library has a makerspace, a computing space, a classroom teaching area, and a reading lounge. We have wide-open spaces and movable furniture to accommodate students walking around enjoying VR technology. Because of our technology’s portability, it can be easily stored. Bardyn: You can increase the effectiveness of your data wall by having good room-darkening shades or investing in new shades to minimize sun glare. We heard that a table would be helpful simulating surgery and that the temperature in the room needs to be adjustable in order to make it cooler for group use. Sanchez: We came to the conclusion that we needed a dedicated space through trial and error. The original installation of our first HTC Vive headset was awkward and didn’t allow enough space or privacy for users. Moving the headsets and computers into a studio space opened up many possibilities, like hosting small classes, managing group work activities, and having fixed demos ready to go. 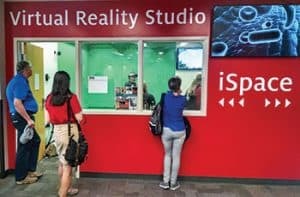 We were fortunate enough to have an underutilized study room next to the makerspace that we could convert into a space with chroma key green walls for mixed reality or multimedia effects, VR headsets, and computers. It also indicated to our users that the technology was here to stay, and that the library was serious about supporting the services and technology surrounding VR. MacLeod: Space is a consideration. Libraries had to find five-by-five-foot clear areas for display and provide a dedicated staff person to monitor usage. Teens have stepped up in many libraries to become the VR support team. Being able to project two-dimensional images of the experience enhanced audience appreciation. There was almost always a line and audience for VR screenings. Putting the VR system on a cart provided mobility and adaptability. How have you trained library colleagues to support users’ interest in VR? Have staff responded in surprising or unexpected ways to this new offering? Holzweiss: Unfortunately, I have only one part-time paraprofessional to assist with the managerial aspects of maintaining a school library. I have a crew of student Techsperts who assist with the makerspace and technology resources in the library. They are adept at teaching others about Google Expeditions and CoSpaces. Teachers appreciate that I have extra hands to assist during lessons, and students are more open to learning because they see what their peers can do. Patridge: Even though we are in our beginning phase, it seems several staffers are quite comfortable with VR and know how to use it. By asking these staff members and our test group to help, we can offer training sessions so other librarians will learn what it is like in the goggles. Right now, with the way our space is set up, we do require one of our tech people to set up the goggles to make sure they display on our six-panel data wall correctly. Bardyn: Library systems staff have introduced library colleagues to the headsets and their features and limitations. User interest in VR seems to be high. 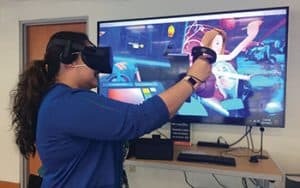 According to our IT staff, hands-on interaction with the Rift and Oculus headsets commonly generates a lot of enthusiasm and leads to brainstorming sessions about how this technology can be used in medicine. It is a pleasant contrast, in what can sometimes be a high-stress profession, to have an offering generate such spontaneous excitement. Sanchez: All of our staff and student employees who work in the makerspace get basic training on the hardware and software for setting up, using, and troubleshooting VR applications. We also host workshops that are open to anyone in the local and university community, staff included. It’s been difficult at times to get everyone on board with the technology, and I think it’s understandable. The technology is still a little too niche for some groups, and it’s cumbersome to set up and wear on your head for long periods of time. I’m hoping that with more mobile headsets coming, you’ll see people acclimate to the devices at a faster pace, much like smartphones. Some people have become total enthusiasts though, given the really cool applications and tools that are out there right now. I just hope that we inspire people to create something thoughtful and creative with VR tools, and not confine the VR industry to mindless entertainment or escapism. Jones: We have had much success with using paid students in a technology program we have called WEBstars, but I have been really pleasantly surprised at the various ages and technology backgrounds of staff willing to learn. The online community in California supports everyone very effectively. Ultimately it’s crowdsourcing VR in libraries so all can participate and contribute that makes it better for all libraries. We were very lucky that our experience took down nearly all the barriers that would have made this a tough adoption to do by ourselves. Coles: VARLibraries held a series of webinars, and we have worked to publicize the community of practice. Most people, including library staff, find VR an amazing experience and have been eager to incorporate it into their libraries’ programming. We also had an amazing response to our application process—much more than we expected.